It is not a peaceful time in the Dells. The young King Nash clings to his throne while rebel lords in the north and south build armies to unseat him. The mountains and forests are filled with spies and thieves and lawless men.This is where Fire lives. With a wild, irresistible appearance and hair the color of flame, Fire is the last remaining human monster. Equally hated aIt is not a peaceful time in the Dells. The young King Nash clings to his throne while rebel lords in the north and south build armies to unseat him. The mountains and forests are filled with spies and thieves and lawless men.This is where Fire lives. With a wild, irresistible appearance and hair the color of flame, Fire is the last remaining human monster. Equally hated and adored, she had the unique ability to control minds, but she guards her power, unwilling to steal the secrets of innocent people. Especially when she has so many of her own.Then Prince Brigan comes to bring her to King City, The royal family needs her help to uncover the plot against the king. 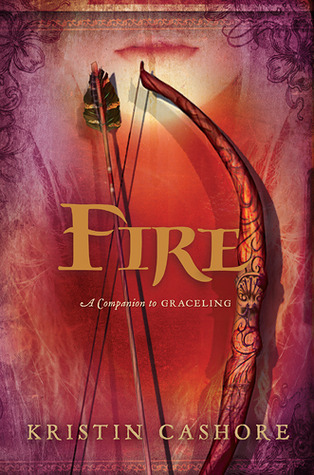 Far away from home, Fire begins to realize there's more to her power than she ever dreamed. Her power could save the kingdom.If only she weren't afraid of becoming the monster her father was. Me after reading this: This was so much better than Graceling. Is it even possible to love all the characters in a book. I laugh, cried, fell in love, fell out of love, hated, stop hating, became understanding and never wanted this wonderful read to end. I can't wait to receive my copy of Bitterblue tomorrow. As soon as I get it I'm going to start it. 2.5 stars So much hand-wringing and so little story. "Don't look at me, I'm too beautiful!" Ugh. Such a disappointment after GRACELING.